Here it comes: another more-is-more Weekend Art Pick for ya! There are a lot of MFA-student open studios this weekend, and there's bound to be something for everybody at them. Open studios are a great way to get a sense of an artist's process and usually provide the opportunity to speak with the artists themselves. Plus, you get to see brand new work. 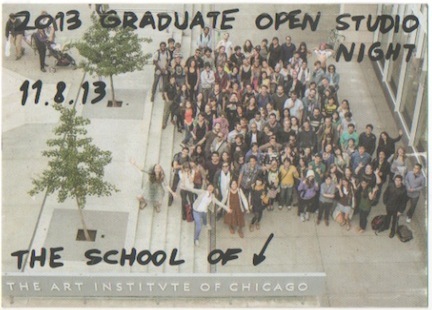 First is the SAIC MFA Open Studio Night tonight, which, if you're feeling ambitious, is a good five-hour engagement. The sculptors and performers are mostly in the Columbus building, which is open first, and then the rest of the studios are kind of spread out over the loop and throughout the evening. If you want to see paintings, make sure to make it to the top of the MacLean Center (full schedule and locations below). In addition to simply open studios, there will be "Curatorial One Night Stands" -- a special collaboration between MA & MFA students in designated critique spaces along the way. If you're not studio-d out by the end of the night tonight, head over to the UIC MFA open studios tomorrow afternoon from 3 to 5 at 400 S. Peoria St.